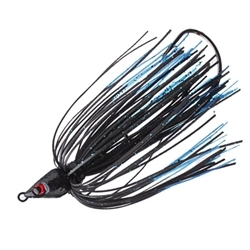 The Mesu Raptor Swim Jig combines a Texas rig with a skirted jig and a Wobble Head. The free hanging hook design allows your Texas rigged plastic to swim more life-like. This Swim Jig has a Trokar 4/0 hook, but if you need to, the interchangeable hook clevis allows you to change it.